Growing apart from friends is hard. Really hard. At one time you were so close, sharing everything with each other, but something happened along the way and now you either never speak or maybe you wonder if the friendship is as important as it once was. In Laura Hankin's The Summertime Girls, former BFFs Ally and Beth are finally forced to face their problems and decide if their friendship is worth salvaging. Early on you can kind of tell that it seems to be Beth's "fault" that her friendship with Ally has deteriorated. Though, like Ally, the reader is in the dark as to why. Bit by bit, the girls begin to repair their friendship but there's something both of them are holding back. It's a fairly big thing on Beth's part but, because of that, Ally doesn't share as freely with Beth as she once may have. I could understand how things would get to this point because it's all about assumptions and not having the opportunity to talk about what's wrong until everything has fallen apart. My heart hurt for the two women because I know how important close friendships are and I hated that theirs had gone so wrong. I liked the setting of this book. It takes place in a teeny tiny town (I love small town stories) where nothing really happens and everyone knows everyone else's business. I also really liked that the book was set in a place that meant so much to the girls as it added an even deeper emotional impact. The main plot of the story was the friendship, but there was a romance subplot for each woman as well. Each relationship had its issues and each woman had something major to learn from them. It's hard to say too much more about each because I don't want to give anything away! I will say that I think things ended for the best for both Ally and Beth. 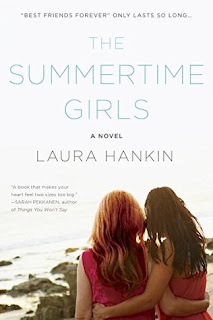 There wasn't anything especially wrong or bad about Laura Hankin's novel. But The Summertime Girls didn't blow me away, either. I liked it and enjoyed my time reading it. I think you would too but I don't know if it's one you should actively seek out – unless you're specifically looking for a book about friends who have fallen out and are trying to fix their friendship.